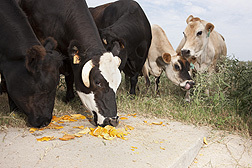 Cows seem to enjoy orange peel and pulp. But these citrus byproducts are more than just tasty and nutritious; they also have an antimicrobial effect in the cows’s gut. Who knew? Those thick, sharp-tasting orange peels that people would never dream of eating are “snack heaven” for cows. Not only does the cow get good roughage and vitamins, but it also gets an antimicrobial boost from the peel’s essential oils. That’s partly because the peel contains a compound called “d-limonene,” which is used in many cleaning products as an antimicrobial agent. And since adult cows can have 1 trillion or more microbes in 1 ounce of rumen fluid, there are lots to mop up! Although experts consider the U.S. food supply to be very safe, millions of Americans become ill each year due to foodborne pathogenic bacteria. Salmonella enterica is a common foodborne pathogenic bacterium that is among the spectrum of microbes found inside the intestines of cattle, swine, and poultry. Transient or harmless organisms, as well as beneficial ones, are also among those intestinal microbes. Because pathogenic Salmonella can be found in the live food animal, reducing its populations in the gastrointestinal tract could potentially improve food safety because fewer pathogenic bacteria would be present during slaughter and processing. Several naturally occurring plant chemicals have shown promise as antibacterials in a variety of applications. Citrus essential oils, for example, have been part of the human diet for hundreds of years, and their effects on bacterial growth and survival are well studied. Citrus oils have been known to kill Staphylococcus aureus, Pseudomonas, Salmonella, and Escherichia coli. 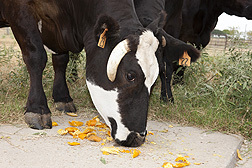 Orange peel and pulp are palatable to cattle. After ARS scientists at College Station, Texas, found that to be true, they conducted studies that show these citrus byproducts have an antimicrobial effect in the animal’s gut. A team of researchers recognized the potential of citrus byproducts as a possible food safety intervention and has been experimenting with them since 1999. The team consists of Agricultural Research Service microbiologist Todd R. Callaway and animal scientist Tom S. Edrington, with the Food and Feed Safety Research Unit in College Station, Texas; ARS animal scientist and research leader Jeffery Carroll with the Livestock Issues Research Unit in Lubbock, Texas; and John Arthington at the University of Florida in Ona. “While foodborne pathogens are found in the gut of food animals, non-antibiotic methods to reduce such pathogens in the live animal are important to improving food safety,” says Callaway. Initial laboratory results published in 2005 indicated that citrus products included in ruminant rations decreased pregastric gut and lower-gut populations of E. coli O157:H7 and a variant of S. enterica, S. Typhimurium, without causing a significant change in fermentation end products. These end products include acetate, which is a volatile fatty acid. Certain beneficial bacteria in the cow’s gut produce these acids, which are absorbed by the animal to provide energy. Callaway’s early data showed the feasibility of using orange pulp as a feed source to provide antipathogenic activity in cattle. He also showed that citrus byproducts (orange peel and pulp) are compatible with current production practices, are palatable to the animals, and can be a “green” solution. Another plus—citrus byproducts are also economically feasible and readily available. While citrus byproducts are fed to cattle because of their high nutritive value and low cost, Callaway has been shedding more light on how to exploit the essential oils inside the peel and pulp that are natural antimicrobials. Collaborations with University of Arkansas-Fayetteville researchers Steven Ricke and Philip Crandall have identified specific essential oils that kill pathogenic bacteria. In other laboratory tests, Callaway’s research group has demonstrated that the addition of a small amount of orange peel and pulp to a mixture of laboratory ruminal fluid fermentations reduced populations of E. coli O157:H7 and S. Typhimurium. The amount given was considered similar to a realistic amount ingested on a farm. The 2008 study, which was coauthored with Carroll, Arthington, and University of Arkansas researchers, was published in Foodborne Pathogens and Disease. 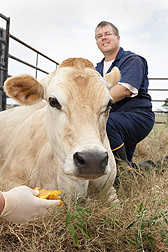 Callaway’s further studies demonstrated that feeding orange peel and pulp reduced intestinal populations of diarrhea-causing E. coli in weaned swine. That study, also led by Carroll and coauthored with Callaway, was published in 2010 in the Journal of Animal and Veterinary Advances. From the time Callaway began studying citrus as an animal gut cleanser, he also recognized that citrus peel can be heavy and expensive to ship long distances. “Even as compost, citrus peels are difficult to transport,” he says. Thus, Callaway’s latest studies investigated the use of processed orange peel pellets. The team fed the pellets to sheep as a model for cows for 8 days. They found a 10-fold reduction in Salmonella and E. coli O157:H7 in the animals’ intestinal contents. Callaway received a grant from the National Cattlemen’s Beef Association (Beef Checkoff funds) to help fund the work. These studies were accepted for publication in 2011 in the Journal of Food Protection and Foodborne Pathogens and Disease. “When approaching preharvest food safety, we take a ‘multiple-hurdle’ approach,” says Callaway. “These studies have the potential to lead to one more in a series of hurdles set up to prevent spread of foodborne pathogens.” Processing plants, for example, depend on multiple hurdles for keeping pathogens at bay. A method of reducing the presence of pathogens in live animals before they enter processing plants could possibly be a key hurdle to add to their list. Callaway is now preparing upcoming field trials of citrus byproducts with collaborators at ARS, the University of Arkansas, and the University of Florida.—By Rosalie Marion Bliss, Agricultural Research Service Information Staff. 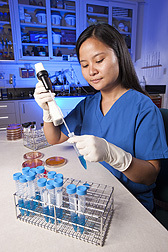 This research is part of Food Safety, an ARS national program (#108) described at www.nps.ars.usda.gov. Todd R. Callaway is in the USDA-ARS Food and Feed Safety Research Unit, 2881 F&B Road, College Station, TX 77845; (979) 260-9374. "Cleaning Cows from Inside Out" was published in the November/December 2011 issue of Agricultural Research magazine.